The Coupon Centsation: TasteGuru - Gluten Free Food Club - 2 Months Free! 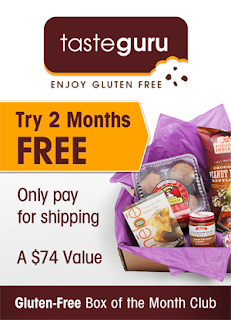 TasteGuru - Gluten Free Food Club - 2 Months Free! Get 2 months free, just pay shipping! Whether because of celiac disease, gluten sensitivity, or a simple desire just to eat better, more and more people are turning to a gluten-free diet to stay healthy and feel good. But not all gluten-free foods are created equal, and finding the best gluten-free products can often be a time-consuming process of trial and error. Our mission at Taste Guru is to do the heavy lifting so that you don’t have to — we think a gluten-free lifestyle should also be worry free (not to mention, savored bite by bite).